Everything that is in a oven-baked lasagna but in a slow cooker. Italian seasoned meat, pasta, tomato sauce, ricotta cheese, mozzarella and parmesan. Lasagna is one of my favorite Italian dishes, I love all of the layers of cheese and the burnt crispy edges. But since summer is in full swing, I don't want to heat up my kitchen especially when its 90+ degrees outside because it takes a couple of hours to cool it down. I don't make it that often during the summer because of that and it can take a while to make it. Also it a time consuming to make. 1. In a small bowl, combine ricotta cheese, 1 1/2 to 2 teaspoons fine sea salt, 1 tablespoon Italian Seasoning blend and 1/2 teaspoon Black Pepper. Cover and place in fridge. 2. Brown meat until fully cooked. Once the meat is fully cooked, add tomato pasta sauce, honey or sugar, salt (to taste), 2 teaspoons Italian Seasoning blend. Add water to sauce container rinse out add to sauce. Simmer sauce for 10 to 15 minutes. I made the sauce the day ahead for flavor of the Italian sausage to infuse into the sauce. 3. Line your slow cooker or spray with nonstick cooking spray, spread a little sauce on the bottom then place two pasta sheet, you may have to break them up to fit. Add another layer of sauce then ricotta cheese and mozzarella cheese then pasta. Continue until you get to the top of the slow cooker. The top layer is just pasta, mozzarella cheese, parmesan cheese and parsley. 4. Cover and cook for 4 to 5 hour on high and 6 to 7 hours on low. Depending on your slow cooker. 5. Turn slow cooker off for at least 30 minutes before serving to cool slightly. Enjoy with bread sticks or garlic bread. i love lasagna, and in a slow cooker? Yes! I also like how you prepared for easy clean up. Ok, you had me at all of that CHEESE on top! This looks so good! Ooh! We love lasagna, but I've never made it in our slow cooker. We might have to give it a shot! I love this idea! I love to make lasagna, but yes, don't want to in the heat! This is the perfect option!!! This recipe looks really delicious and very simple to make. It also sounds perfect to those who wants to make this without the availability of a microwave oven. I will definitely try to make this. 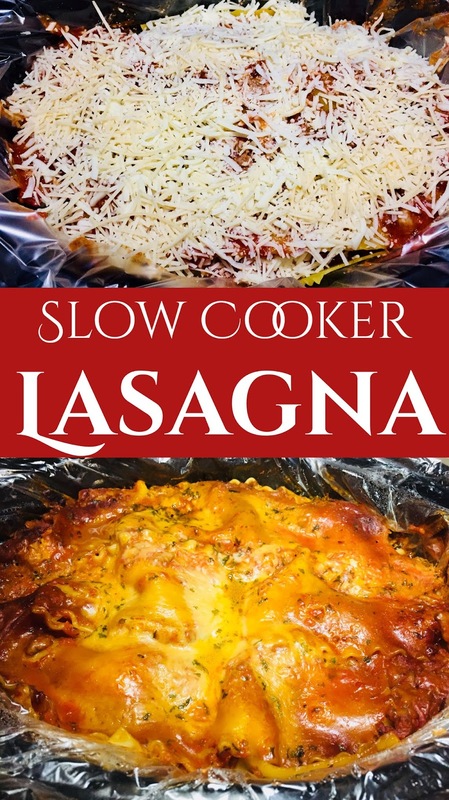 I have never heard of making lasagna in a slow cooker, but it is such a great idea especially in the hot summer months when you might crave lasagna but not the time spent in the kitchen or the extra degrees in the house! Preparing in slow cooker seems like a great alternative. You got the perfect texture of cheese too. I will try this out. I love the idea of making homemade lasagna in the crock pot. Not much clean up and easy. I love using my slow cooker but I haven’t tried lasagna in it yet. What a great idea! Looks yummy! This is amazing. Lasagna is a favorite of mine and anything I can do in the slow cooker jumps to the top of my list. With 2 small kids and being 6 months pregnant, the last thing I have at 5pm is energy to make a big meal, so cooking dinner at 930am is definitely my favorite! Lasagna is one of my favorites of all time. Being able to cook it in a slow cooker is a big plus, so thanks for the recipe. This looks so yummy, this is making me so hungry now! I feel like this would be almost easier then regular lasagna. Wow! It looks very yummy and delicious. Our all time favorite comfort food. Thank you for this great recipe. This looks so good! I LOVE making lasagna in the crockpot! It's so easy and low-hassle. I may have to give this recipe a spin! I love the idea cooking lasagna on slow cooker, simple, delicious and almost no prep involve! Now that's interesting! I wouldn't have thought about making lasagna in a slow cooker. Love it! This looks so good. I wish I had time to make this for a family gathering coming up. I loved the you used turkey. Woah I've never tried to make anything but soup in my slow cooker! Lazania is also my favorite Italian dish but I have never cooked it in a slow cooker. How different is the experience of cooking it in a slow cooker as opposed to cooking it in the oven. Is the taste any different? My husband would love this! Anything slow-cooker to make life easier is A-okay with me! That looks extra cheesy and delicious. I always enjoy super easy slow-cook recipes. Thanks for sharing! Great idea to put in a slow cooker! Prepare and walk away. Love it. Raally Love this recipe. I am going to try a a vegetarian version. First I need to get a slow cooker. Ha! I have made spaghetti in a crock pot. I never thought of lasagna. I'm so doing this! Love the receipe. Seems like the perfect recipe for anyone with a busy schedule! the result turned out great. Pasta is one of the favorite food of my family and this recipe looks really delicious and it really simple to make. I am sure my husband and even my kids will love it. Oh my goodness that looks ooey gooey delicious. I love being able to just let something cook like this. Thanks for sharing. Oh my gosh this looks so delicious and so easy! I'm so glad I stumbled upon this recipe! I'll definitely be trying it out! This looks like a very good idea - will try the vegetarian variants with different veggies. This looks so easy to make! I'm always looking for recipes that I can make to last over a few meals since it saves me time during the week. I can't wait to experiment with this new recipe! I am feeling hungry already after looking at your pictures. I love lasagne. Oh Yumm! I love the idea of making this in the slow cooker! Seems way easier! Wow this recipe looks incredible! I cant wait to make some lasagna this week!!! Thanks for the post! This looks soo good! I love lasagna! Ok I'm drooling! This sounds amazing and such an easy way to make it! I'm all about anything in a slow cooker!